Well, it’s cold, again. That “crawling up your back, hunching up your shoulders, why didn’t I put on the big bulky sweater, I can’t feel the ends of my fingers” kind of cold. November has come to us in full force and although I wouldn’t normally welcome facial hair, I have been looking almost enviously at my male friends who are sporting moustaches for this month, in support of prostate cancer research and programs and men’s mental health initiatives. As of 2011, Canadians were the largest contributors to the Movember charities of any nation, with 234,956 people registered and CAD $17,838,404.00 raised to date. Even if I could manage to grow a decent moustache in a month, I am in rehearsal for It’s a Wonderful Life, and I don’t think the director would take kindly to my character sporting one … as I am playing George Bailey’s Mom. But I do think it’s a worthy cause and to encourage those hirsute pals of mine, including the male bar staff at the Arts Club Theatre (where I am working) my family and I are more than happy to proudly sport chocolate moustaches in a variety of styles. Perhaps this has given me the inspiration to do a batch of moustaches, free hand. 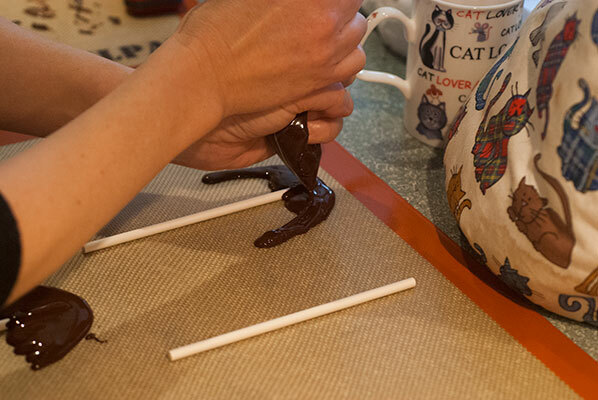 Yes, I am going to attempt to make moustaches on a stick, using free poured, tempered chocolate, and a steady hand. 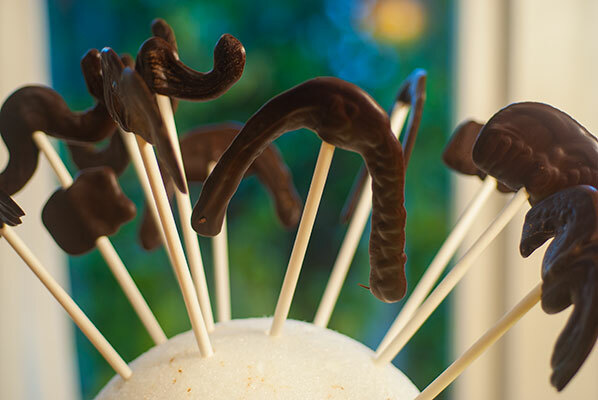 For this fun project I used 8 ounces dark chocolate and a dozen rolled paper lollipop sticks I had, left-over from a batch of cake pops. I laid the sticks out on my large Silpat mat, staggering them, to allow for as much room as possible between the tops. 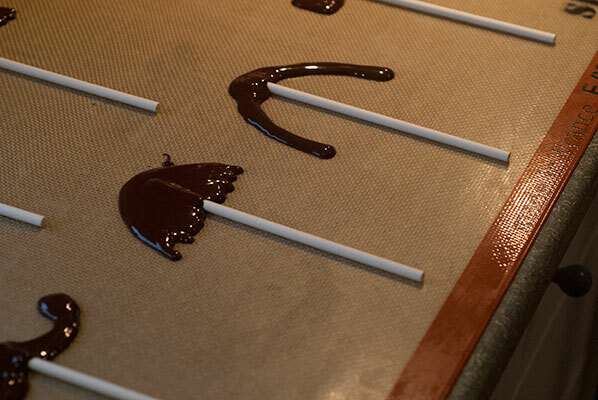 I was a bit concerned that I would not have adequate chocolate coverage across the backs of the moustaches, but this did not turn out to be an issue, as I rolled the sticks in the first pass of poured chocolate, which seemed to more or less embed them. During the tempering process, I tried to “hurry up” the necessary temperature drop to 27 degrees Celsius, by placing a chiller bag from our freezer in one of my metal mixing bowls, and placing the bowl of cooling chocolate over this – an impromptu ice bath. If you are going to try this, it is important to have the bowl of chocolate resting on the chiller bag for short bursts of time, all the while stirring the mixture, so as not to create cold patches, and to ensure the creation of the desired V formation crystals. This seemed to bring the temperature down smoothly (it certainly took less time than it has in past seeding efforts), and once at 27 degrees, I placed the bowl of chocolate back in the microwave oven for 30 seconds, to bring the temperature back up to the required 32 degrees Celsius, to ensure a good temper. Then, working very quickly, I poured the tempered chocolate into a thick plastic freezer bag, and snipped a tiny opening at one corner. 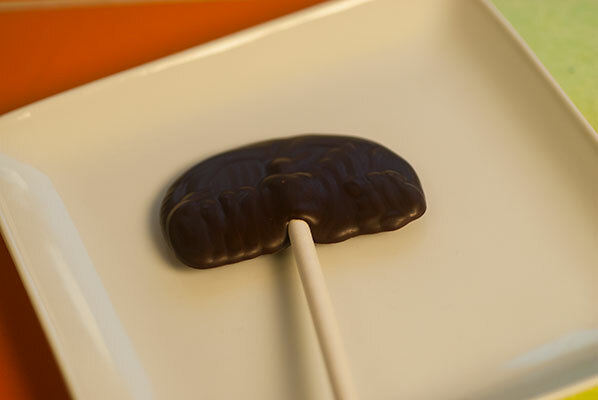 Massaging the bag of chocolate in two hands, I poured a thin stream of chocolate over the first lollipop stick to create a base, then swooping out form this centre, swirled the chocolate into an upturned moustache “arm”. I was surprised at how much control I had with a flexible bag full of liquid chocolate, but it seemed to flow out of the tiny opening in a steady but not overwhelming stream, and I was able to stop the flow by angling the opening up. 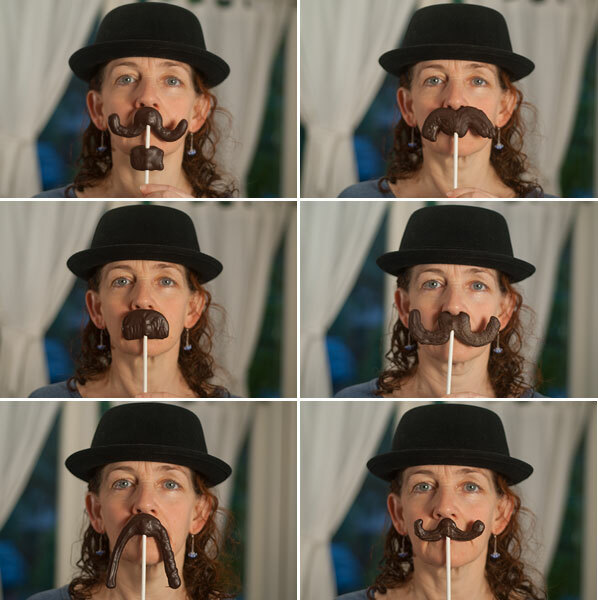 It then became a race against time – or rather, against cooling chocolate to create as many moustache designs as I could. This is where my patient family is invaluable. I had already looked up a template of different styles of moustaches, but couldn’t pull my face up long enough to focus on the far off screen of my laptop, so my dear husband and Younger Son were called into service, shouting out differing style names such as “toothbrush”, “Ned Flanders”, “Walrus”, “long skinny rock star”, “melodrama villain”. My husband even threw the curve ball of “soul patch” so that was added to one moustache, with a space for the mouth. If I were to do this again (and I think I definitely will) I would like to make some “salt and pepper” ‘staches, using white chocolate brushed onto the dark with a silicon pastry brush. I squeezed the excess chocolate out to cool completely on the Silpat mat. The bag could just be disposed of, at this point, but I am a frugal Scot, and opted instead to wash it out, and hang to dry for the next batch. It was really fun, took no time at all, and I had a dozen chocolate “Mo”s cooling on lollipop sticks. 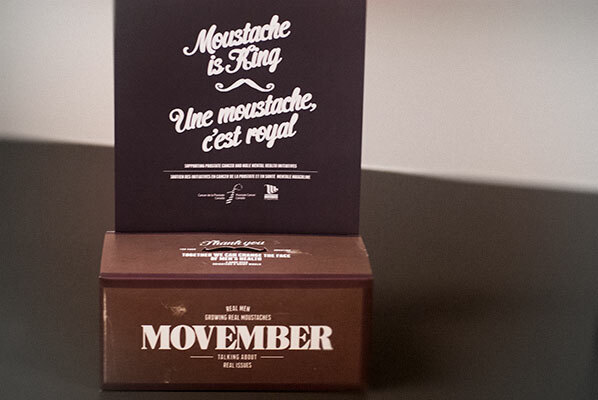 I think I’ll take some into the bar tomorrow, to encourage the “Mo Bros” at the mid-way point in their task. 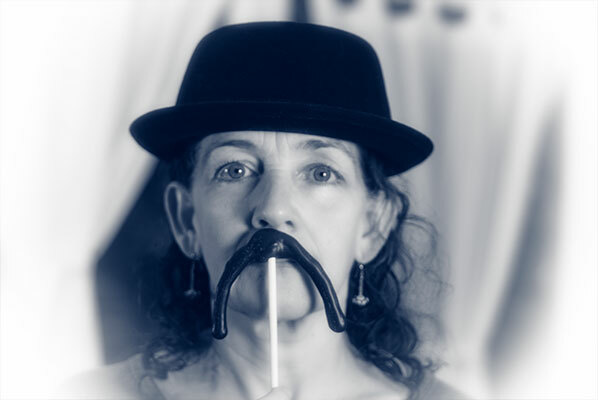 Or perhaps I will walk into rehearsal tomorrow sporting one … hmm, maybe Ma Bailey would actually suit a nice Handlebar, after all.